The approaching of another milestone means having to make another important decision, one that could be life-changing. As graduating high school seniors, students must make their own adult decision as to what path to continue their life's journey. No more school to tell them what to do. For those that choose college for their next chapter, they have to pick which college, then, of course, which major. As for me, I--like many others--went the college route by parental demand. But I didn't yet know what I wanted to study so I entered as an undeclared major. Then, in my junior year it came time to pick a major which I acheived through a process of elimination. I ruled out subjects I didn't like, then pieced together the ones that interested me most and went from there. Finally, as college graduation was upon me, that was the time to decide what I would be doing with my degree and where it could possibly take me. With proper planning, people don't have to worry about whether they'll be able to find work with their degree. Instead, you can find ways of making your degree work for you. College students should always be planning what's going to happen post-graduation. Plans are bound to change, but if you're constantly thinking about these changes you'll better set yourself up for whatever pans out. Since it's more common for college seniors to graduate in the spring, the summer job-hunting season is a busy and highly competitive one even if many still don't seek jobs immediately. While it may seem far away, the summer will be here before grads know it. Spring break will come and go and all of a sudden they're picking out their cap and gowns. But now is not the time to ride the last semester wave, it's time to paddle out to the next one. This means applying for internships and jobs NOW. Even though the unemployment rate went down to 8.4% last month, the outlook for youth is still pretty grim, according to the Bureau of Labor Statistics. The youth unemployment rate for last July (usually the peak of summer employement) was at 48.8%. It hasn't been that low for the month since 1948. To avoid repeating that bleek number this year, here are some tips to help grads get going on their careers. Job openings in a tough market are hard to come by, especially during the summer season, so students have to use every resource they have to their advantage. Go to places like college career centers, talk to personal contacts and look through job-hunting sites. Social media is an easy one for college students but a very important one is LinkedIn as it will connect you to colleagues and professionals. It's also a good way to establish personal relationships with HR managers and recruiters. Being willing to relocate can also benefit you. Sometimes the opportunities aren't in the same places as you are so you have to be flexible in going out of your way for them. By planning early, you can make arrangements ahead of time for your next move. Being mobile gives you even more opportunities that if you were just to limit your search to what's nearby. Even if you search far and wide, you might not get your dream job right after graduation. But any start is a good start. You can still gain valuable experiences that you can take with you into other industries. Relevant experience is just as good as experience in the exact industry you wanted. When it comes to building your resume, it's not so much about the major as it is highlighting their skills and talents. Hiring managers want to see your capabilities and potential whether it has to do with your major or not. English majors can be just as good of problem solvers as business majors. Being paid is ideal but it's not all that realistic when it comes to internships. Many companies take on interns because they need workers who are okay with getting little to no monetary compensation. The actual compensation comes in the form of experience and something to add into a resume. The value is in the higher chances of opportunities you can get from the gained experience and skills. Research companies and organizations that you find interesting or are relevant to your career path. Be open to all and every career possibilities as they can only move your career forward. Many people dream to see parts of the world they've only seen through picture, but without the necessary resources it can be extremely difficult. Unless you have a plane, a ton of cash, and background knowledge on the customs of other countries at hand, then just picking up and going isn't realistic nor practical. Traveling requires a lot of preparation and saving up for the journey takes time. With other parts of your life going on it's nearly impossible to find the time to plan going to a foreign place for the first time. But what if you someone helped you and took care of some of these concerns for you? And to top it off even paid you for being abroad. Sounds almost too good to be true but there are a number of career options out there that offer doing the same work here but in a far away land. Immersing yourself in a completely new culture is exciting and an experience that many never get to experience in their lifetime. The following are a few jobs that can take you a whole new world. 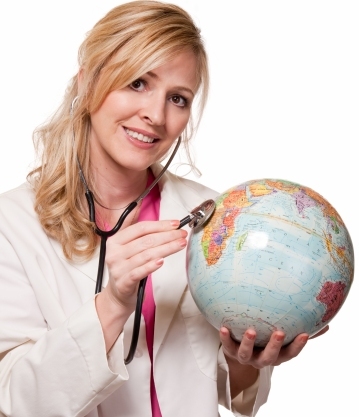 There is a shortage of nurses worldwide and whether you get to go to the country of your choice or wherever you're needed most, your position as a nurse can take you just about anywhere. In a desirable circumstance, some wealthy, aging, individual may prefer a personal medical staff of which would include you. In such a scenario you could be traveling all on their dime while enjoying the jet setting lifestyle. Over the course of many years English has now become a global language and is a valuable skill to have if it's not your native tongue. If you've always had a knack for language arts then attaching that with teaching credentials pretty much gives you a passport around the world.Of couse, you'll need to know a second language in order to communicate with those you're teaching. But wherever you choose to go, your ability to teach in an institution can always be compensated. Freelancing allows you to do work for others without being tied to a particular company; essentially you're contractor. You probably won't be receiving a regular paycheck but you'll be able to sell your work to whoever is willing to pay the most for it. This is perfect for people who lead lifestyles that need flexibillity in their schedules. You get to set your own schedule, travel where the action is, and develop a valuable craft that will always be in demand by the masses who live vicariously through you. Cruise ships are mini worlds of their own with an extensive staffs ranging from no skills to highly advanced skills. This could be the perfect opportunity for someone looking for full-time work with little to no experience. But expect to work long hours. On the plus side, your room and board will be taken care of and you'll be earning money at the same time. And wherever the ship ports is a chance for you to explore a new destination while you're not working. While you'll be out on the water for much of the time, you'll still be able to rest your head at home every now and then. Heading to a country that is tourist-ridden during the summer season will have opportunities for extra help especially from those with English speaking skills. It's no mystery that first-time travelers lacking the language skills are more comfortable when they hear their native language. They may be coming from North America, Europe or Australia but you can bet that all of them will value getting information from someone they can fully understand. Jobs abroad are great way to get to know a different part of the world and open your eyes to things unique to that culture. With or without the needed skills you can earn a living in a variety of industries that can train you or hone the skills you already have. To see the world while making money, it's a win-win situation! Continue reading if you've ever wished your office came with a manual on the do's and don'ts of the workplace. You're not alone. I would consider myself a social, talkative person just like anyone else. But for some reason when it comes to talking to management, I become a deer in headlights. The switch in my head goes from normally functioning human being to a robot. I feel the need to methodically calculate every word said and move made for fear of breaking the code of office etiquette. But why does it happen at all? After all, bosses are human beings too. What you don't want to do is overcompensate by being too laid-back. Remember, he's still the one that pays you. The key is to find the balance between casual and professional. You can still have a personality under that suit, but with boundaries. Think about how many times you said something and then two seconds later wished you had said something else if only you hadn't gotten too hasty in your response. The same may happen in an email, when you reread it and realize maybe you should have a toned down the sarcasm. Etiquette is a tricky thing, let alone office etiquette. Now that many businesses are becoming more employee-oriented with things like open-plan work spaces and informal digital communication. Here are some tips to keep you from clamming up or putting your foot in your mouth. It's perfectly fine to get your morning going with your iPod or other mobile device but once you enter work perameters get yourself into your professional mindset. Leaving your earplugs in is like holding up a Do Not Disturb sign to everyone around you. You make yourself unapproachable and seemingly unfriendly. If you want be alienated this is a good way to do it. Save Your Email Checking For Your Desk. Again, unplugging yourself is impolite and puts your right back into the isolation room. The elevators and hallways are good opportunities for sparking up chats with coworkers. Engaging with them allows you to get to know one another and you can't get ahead hiding out in your shell. Get going on those positive interactions if you want to see some positive results. Respect Others' Time and Space. If you need to talk to someone, don't go to extremes of just barging in attempting to have a strong approach--this is simply rude--or the opposite of sneaking up on them so as not to be "disturbing"--this is just as uncalled for. Honestly, you can't say that you would appreciate either one so as mentioned before, find a balance. Announce yourself before you enter by knocking or saying, "Excuse me." Always pause and wait for their acknowledgement. And to avoid being sneaky make sure they can see you coming so they don't feel uncomfortable. You may want to also call or email them in advance so they'll be expecting you. Etiquette in All Forms of Communication. It is equally important to carry over the same standards of etiquette when communicating by phone or email as you would in person. Don't call someone back and leave a voicemail knowing well that they aren't there to answer. Doing this is an obvious act of avoiding them. Messages should be left at a time when they can receive it shortly after and the same goes for emails. If you get a thought late at night, make a note of it and put it off until the next day. This goes both ways, bosses should also wait until office hours to reach employees and it leaves that boundary there for them to not be reached at odd hours of the day. Your Attire is a Reflection of You. Dress according to the office standards. If your boss wears a suit then you should too. If he wears jeans and t-shirt, then wearing them yourself is appropriate but consider adding a little dressiness, like a blazer for example, to what you're wearing so as to make a good impression. Keep this rule at work functions as well. You may be out of the office but you shouldn't show up like you're on vacation. 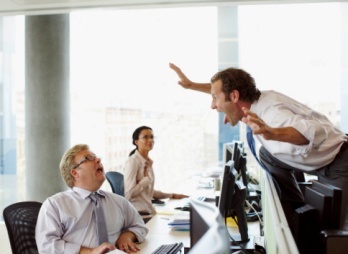 If you find yourself in an office etiquette no-no, let it slide lightly. Laugh it off and quickly recover from it. It's easy to make these mistakes, if only only a manual were given. But with enough practice a mental manual will follow and you'll go from feeling awkward in the office to being the admirable example before you know it.